EXPLORE THE 5TH GRADE CURRICULUM. 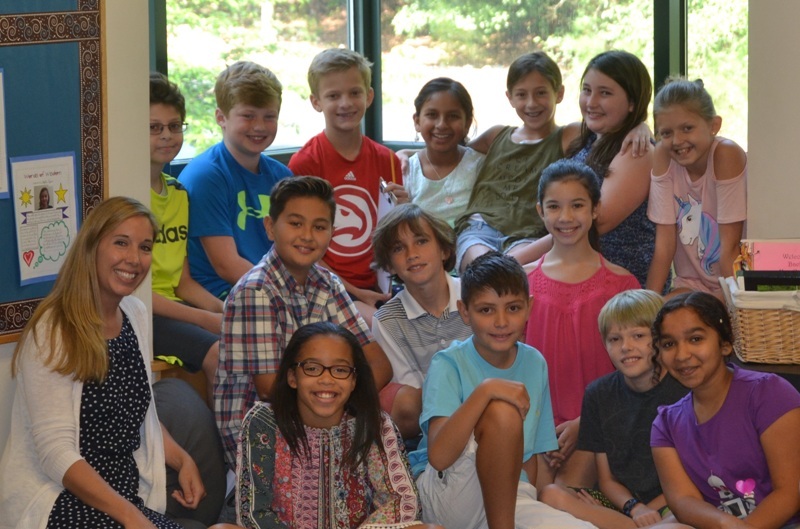 Fifth grade Language Arts curriculum encompasses reading, writing, listening, and speaking. Instruction in the areas of Language Arts occurs both within each discipline as well as via cross-disciplinary programming, linking acquired skills to the higher levels of thinking such as analysis, synthesis, and evaluation of literature and multi-media materials. By fifth grade, students are advanced decoders and possess comprehension skills that will carry well into our Upper School program. Our fifth grade curriculum includes multiple novel studies and cross-curricular reading in the non-fiction areas of science and social studies. A healthy respect for well spoken and well written communication continues this year, as does each student’s growing expertise as a creative writer and poet. An understanding of proper grammar, syntax, form, and presentation is woven into the language arts program. Vocabulary enrichment, presentations, and projects provide further opportunities for students to shine and demonstrate accelerated learning. As students progress through our rigorous curriculum, they also continue to hone computational skills on a more advanced level in place value, operations, number theory, fractions, fractional operations, and decimals. Add into this math mosaic a strong emphasis on probability, statistics, geometry, measurement, ratios, percents, plus problem solving and you have a foundation upon which algebraic expressions, equations, and operations can be introduced and expanded. Competency in basic math operations is never forgotten, as a student’s future success in math is very dependent upon skill and confidence in operations. These three components of a strong Social Studies curriculum are well founded in the fifth grade program. Students focus on regional, national, and international viewpoints of history and culture. Continued emphasis on map and globe skills, current events, and outstanding cross-curricular projects truly makes this subject area come alive for students. From Mayan, Inca, and Aztec civilizations, to the Renaissance, reformation, the Civil War, westward expansion, and feudal Japan fifth graders delve into a richness of learning that creates a one-of-a-kind American and world history and geography program without parallel. The Wood Acres School is most proud of its designation as an International Spanish Academy from the Embassy of Spain and the Consulate of Spain in Washington, DC. This recognition has been awarded to less than 100 schools in the United States and Canada for outstanding programming and commitment to the development of bilingual graduates. The Wood Acres School’s groundbreaking science curriculum literally leaps from the mind-numbing “read the chapter and answer the questions” approach to a hands- on, experiential laboratory setting that has fifth graders learning and living the scientific process. Taught through integrated CELLS (Core Experience Learning LabS) curriculum modules provide in-depth study of work and simple machines, earth’s forces, heat, microscopic explorations, inheritance and adaptations, properties of compounds and an exploration of density. The science-math connection is strong throughout the program and provides fifth graders with the initial tools to become independent researchers with problem based science projects. With Wood Acres’ Spanish program beginning with three-year-olds, the student of Spanish in fifth grade is becoming more advanced and comfortable with both conversation and grammar components. Taught by native speakers with a formal curriculum imported from Spain, the acquisition of foreign language skills is outstanding at Wood Acres. Instructional methodology includes TPR, total pupil response, which encourages students to become active speakers, listeners, writers, readers and singers in the Spanish language. Students in fifth grade are also exposed to some short works by quality Spanish authors, bilingual books in content areas such as science, and arm chair cultural travel. Fifth graders are interested in both team activities and individual physical challenges and the PE curriculum for them is based on these dual loves. Pre and post testing in many areas of physical fitness have students working throughout the year on improvements in running, stretching, strength, and endurance. Intermittent team games help both skill development and team spirit in the physical fitness unit. Many fifth graders participate in cotillion classes outside of school as well to hone social graces as well as dancing prowess. Taught by an accomplished artist in her own right, the Wood Acres art program for fifth graders is a natural continuation of rich curriculum of the Grammar School. With an ever-refined eye for line, form and perspective fifth graders blend didactic instruction with creative, edgy and captivating art projects. Students are trained to look at the world through the eyes of an artist, seeing lines of symmetry, perspective, geometry, color, balance, shading, tone, and depth as the art of nature and man’s creation. Picasso would be proud. Blending classic music instruction with a strong youth appeal, the Wood Acres band, helps create students who become educated audiences as well as engaged performers. All fifth and sixth graders participate in band and play an instrument of their choice. Students read music, perform in concerts, and learn about the culture surrounding the music they study. Band concerts give students ample opportunities to prepare and perform in front of live audiences. The Wood Acres School is one of only a few private schools to offer band during the school day and as part of the student tuition (students rent or purchase instruments). Technology is as common in a fifth grader’s life as food and friends. By honing computer skills from keyboarding, to Microsoft Office skills, to responsible Internet use, fifth graders at Wood Acres learn how technology enhances all teaching and learning. A technology specialist meets regularly with classroom teachers to plan projects that relate directly to academic areas in the fifth grade curriculum. Fifth graders will work on literary reports in the lab using Microsoft Word during one lab period and then use Excel spreadsheets to present scientific findings to the class in the next. Fifth graders also travel to the STEM lab, also known as the HIVE, to work on different projects.